Our delicious honey is organic and local. It is lightly sweet and flavorful as the bees pollinate on hibiscus flowers. Use it in your tea, coffee, blended drinks and as a topping on snacks. We offer three sizes: 24 ounces, 6 ounces, and 2 ounces. 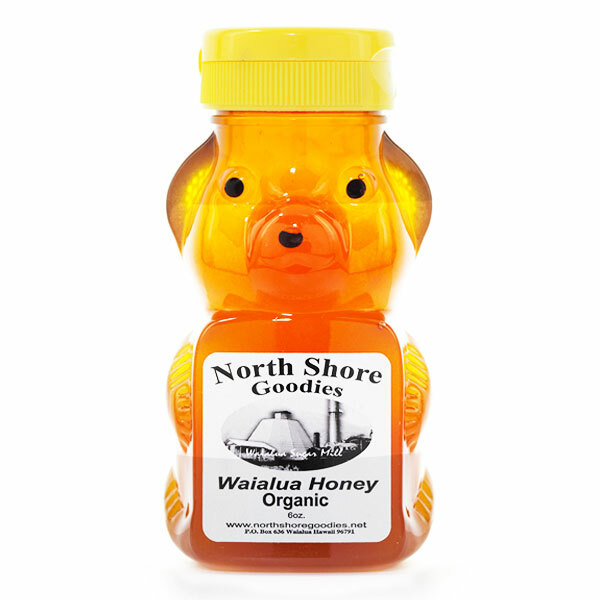 Our Waialua Organic Honey is free from chemical residue, as the plants surrounding the hives have not been sprayed with pesticides or herbicides of any sort. Our bees are very well cared for in a “Bee Friendly” environment. Our bees ingest the nectar of Hibiscus flowers that have not been touched by pesticides of any sort. Hibiscus has been used in herbal teas for years. Many religions and cultures have used the hibiscus plant for many things from home remedies to special ceremonies. The flower has a natural diuretic; it contains vitamin C and minerals. With the hibiscus being Hawaii’s state flower, it is not unusual to have hibiscus honey in Hawaii. Our hibiscus honey has a more unique flavor profile than other varieties. It is not only used as a sweetener to teas and coffee, but a topping in some places for shave ice, cheesecake, and vanilla ice cream. © North Shore Goodies – All rights reserved.